Far Out Fairy Tales is a new, very odd graphic novel series for young readers from Stone Arch Books. 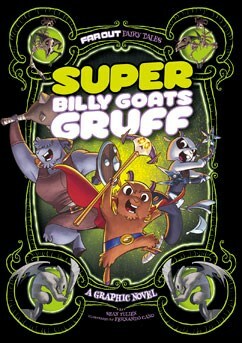 And at least one of them is of note to furry fans: In Super Billy Goats Gruff, the three brothers named Gruff head off to get themselves some grass… and wind up trapped inside a video game! Now they face evil trolls with the powers of a warrior, a wizard, and a ninja! All brought to you in full color by writer Sean Tulien and illustrator Fernando Cano. It’s available now, and Capstone has more.